On 28 Aug. 2016, at 01:26 UT, the 35 meters large near-Earth asteroid 2016 QA2 made an exceptionally close encounter with our home planet. At the flyby time, the asteroid was at about 84.000 km from the Earth surface! That is 0.22 the average lunar distance, still a safe one. At Virtual Telescope we managed to cover it around the flyby, getting amazing images. The image above is a 60-seconds exposure, remotely taken with PlaneWave 17″+Paramount ME+SBIG STL-6303E robotic unit available at Virtual Telescope. The robotic mount tracked the EXTREMELY VERY FAST(1500″/minute) apparent motion of the asteroid, so stars are trailing. 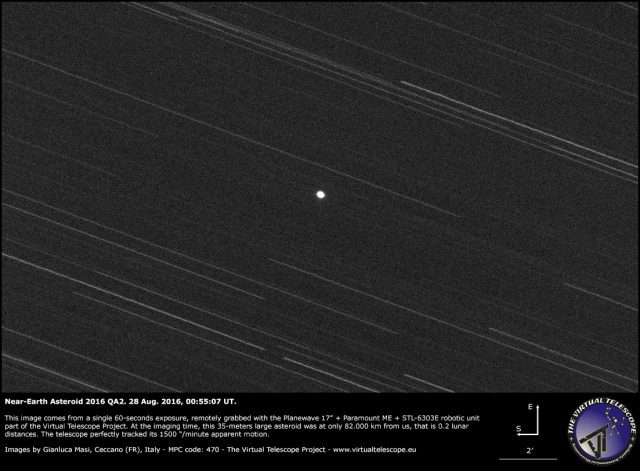 The asteroid is perfectly tracked: it is the BRIGHT, sharp dot in the center. This is with no doubts a super result, showing the amazing capabilities of the Virtual Telescope in tracking extremely demanding asteroids. Below is a stunning video, showing the extremely fast apparent motion of 2016 QA2. The video is 113X faster than the real motion. I always thought that all near-earth-objects are observerd/tracked/monitoring constantly?